N-nitroso dimethyl amine belongs to a family containing substances that are extremely potent and carcinogenic. They are known are N-nitroso amines. N-nitroso amines are formed by the reaction of organic nitrogen and a nitrosating compound like amides. They are generally formed by electrophilic reaction. These nitroso amines are generally found in water, soil, air (Hecht S.S., Hoffman D., 1988). Generally, nitroso amines are formed within the body due to the reaction between components that have entered into the body via various routes. The general structure of nitrosoamines as in figure, Where R1 and R2 are alkyl or aryl groups. Nitroso amines and their precursors generally enter into the body through food contamination or water pollutants or by direct soil contamination (Osterdahl B.G., 1990). A little portion of nitrates which are one of the precursors get converted into nitrites in the saliva. These react with other nitrogen compounds to form nitroso compounds. Most of the nitroso compounds are formed in the GIT are the main reason for human exposure. Formation of nitroso amines depend on several factors like pH, temperature. They are stable at bodily conditions (Hinuma K. et al., 1990). N-nitroso dimethyl amine (NDMA) is most commonly found substance of this family. NDMA is a nitroso amine compound. It is a yellow, oily liquid with low viscosity and is volatile in nature. It is soluble in water, alcohol and other organic solvents. It is sensitive to light especially UV light. It readily undergoes photolytic degradation. NDMA is combustible and undergoes decomposition. When heated it releases oxides of nitrogen which are toxic in nature. Dimethyl nitrosamine, N-methyl-N-nitroso methanamine, nitroso dimethyl amide, N, N-dimethyl nitrous amide. NDMA is mostly released via the industrial sources like tire manufacturing companies. NDMA is not much found in the direct atmosphere as it easily gets photolyzed during the day. There was a prevailing theory that NDMA is formed in air and gets mixed with water during the night time. Main routes of human exposure to NDMA is through ingestion, inhalation, even skin contact. Most exposure to NDMA is by food, tobacco smoke, pesticides, certain disinfectants even drinking water. Atmosphere: very low percentage of exposure is observed in air. Generally, it is seen in tobacco smoke and industrial toxic gases. Food and Soil: NDMA may enter into soil due to leaching into the soil. It also gets accumulated into fruits and vegetables due to excessive use of pesticides and herbicides. 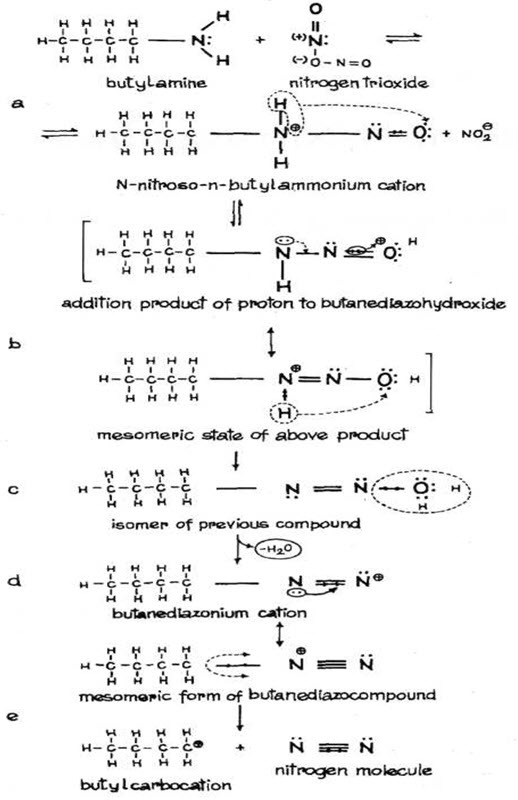 NDMA is formed by nitrosation reaction. 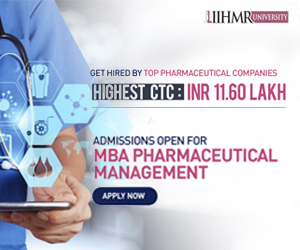 It is formed when nitrosyl cation or cation releasing agents such as di methyl nitrogen trioxide react with amines like dimethyl amine or trimethyl amine or compounds containing organic nitrogen. The reaction in laboratory conditions occurs at 3-3.5 pH. In the body, the acidic pH in stomach facilitates the formation of NDMA. Nucleophilic anions act as catalyst for the reaction to occur. As NMDA is also a nitrosoamine it has similar formation and biodegradation steps as nitrosoamines as whole. Organic nitrogen is derived from I, II, III amines, hydroxyl amines or peroxides of amines which are products resulting by transformation of fertilizers and herbicides containing phenoxy acetic derivatives. For amines, the nitrsonium cation (NO2+) is obtained from nitrogen trioxide (nitrogen III oxide). The nitrogen III oxide attacks a pair of electrons on the nitrogen of the amine compound, having a nitrite anion and nitroso ammonium cation (Fig 2.a). The further reactions of the cation depend on its chemical structure and the properties of the nitrosocompound and reactions conditions. The nirosoammonium cations that are derived from primary amines undergo rearrangement by transferring two protons from amine nitrogen to oxygen (Fig. 2.b) and followed by elimination of water (Fig. 2.c. ), thus producing a diazonium cation (Fig.2.d). Aliphatic diazo cations undergo elimination of nitrogen and reconstitution to appropriate carbonium ion (Fig. 2.e.) (Kupryszewski G., 1979; Przezdziecki Z, 1980). Disintegration of these compounds is highly exoenergic due to high energy bonds of N2. Fig.2. 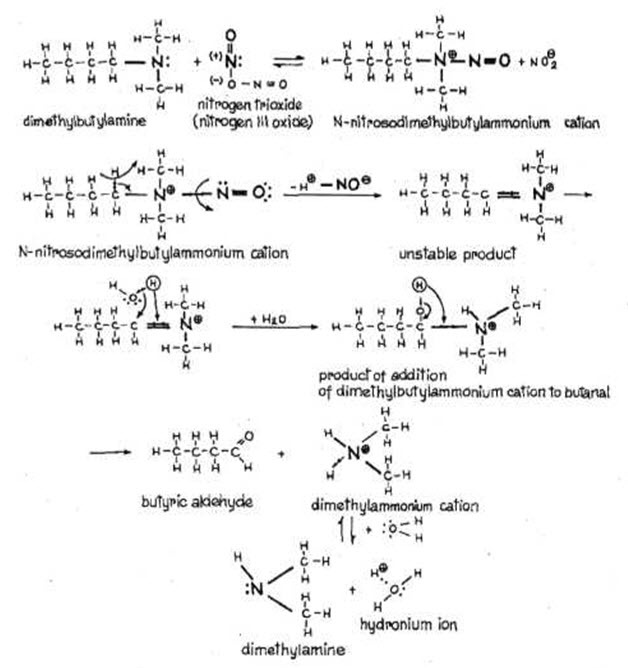 FORMATION OF NITROSO AMINES FROM PRIMARY AMINES AND THEIR TRANSFORMATIONS (Kupryszewski G., 1979; Przezdziecki Z, 1980). Transformation of secondary amine derived nitroso ammonium cation depends on the ability of detaching of protons and formation of N-dialkyl nitroso amines (Fig. 3) (Kupryszewski G., 1979; Przezdziecki Z, 1980). Fig.3. FORMATION OF NITROSO AMINES FROM SECONDARY AMINES (Kupryszewski G., 1979; Przezdziecki Z, 1980). The transformation of tertiary amine derived nitroso ammonium cations at low temperatures occurs slowly by producing aldehyde compound and secondary amines (Fig.4) (Kupryszewski G., 1979; Przezdziecki Z, 1980). Fig.3. FORMATION OF NITROSO AMINES FROM TERTIARY AMINES AND THEIR TRANSFORMATION (Kupryszewski G., 1979; Przezdziecki Z, 1980). The formation of the nitrosoamines depends on several factors like pH of environment, alkalinity of amine compound, temperature. At low temperature and pH, the primary aliphatic and aromatic amines do not form nitroso compounds, and the reaction of these compounds with nitrites proceeds by utilization of diazonium salts. Alkalinity plays a key role in formation of nitroso compounds from secondary amines. The rate of formation of the nitroso compounds increase proportionally with the decrease in the alkalinity of the secondary amine. There is no reaction observed between tertiary aliphatic amines and nitrogen III oxide in strongly acidic pH. However, increase in pH and temperatures conditions favours the process of formation of nitroso compounds. Whereas, tertiary aromatic amines undergo c-nitrosation at para position of the aromatic ring (Nikonorow M, Urbanek-Karlowska B., 1987). The process of formation of nitrosoamines can be studied in the nature itself. The formation of nitrosoamines can be observed in nitrogen-fixing bacteria. These bacterial biochemical processes perform nitrification and denitrification, thereby helping in formation of nitrosoamines. Some of these bacteria are: Arthrobacter, Mycobacterium, Pseudomonas, Bacillus, Streptomyces, Nocardia and some soil-grown fungi like Cephalosporium, Fusarium, Candida, Aspergillus and many more. It is believed that these microorganisms reduce nitrate to nitrite, transform proteins to secondary amines and create an appropriate environment that is slightly acidic ((Hecht S.S., Hoffman D., 1988). 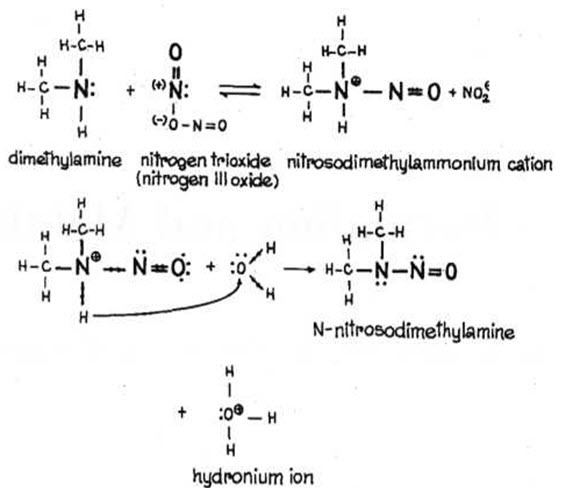 It is suggested that the interactions, that are hydrophobic in nature, between hydrocarbon radicals of the alkylamines with the lipid compounds of cell, present mainly in bacterial cell wall, increase the rate of formation of nitrosoamines, releasing a pair of electrons of amine nitrogen. The cationic bacterial wall surfaces attract nitrate anions and form suitable nitrosating agent at high concentrations in the presence of amines.